We are celebrating the GRAND OPENING of El Aguila Dorada’s second location. After almost 2 years of construction the new location is 3 times bigger and 3 times more amazing. Come to join us for some authentic Mexican food at one of the best restaurants in Bayonne. Israel first came to America at the age of 16. His first job as…. (drumroll)… a dishwasher. Not too exciting but after one month of proving himself Israel quickly worked his way up from a dishwasher into prep/ line cook station. Here is where his passion for food was born. His hard work paid off when he then became head chef of Hendrickson’s Corner for over 13 years. Without formal training, here he learned everything there is about good food and customer service. He worked long hours but on his free time Israel liked to relax and play basketball with friends. Usually by the end of the games him and his teammates would be hungry so as a good friend should, Israel started making Tortas (mexican sandwiches) for lunch. That’s when him and his wife, Irma thought “let’s make more food and sell it.” So they started to sell his food from home. They sold tacos, quesadillas, pozole, and more on weekends to family and friends. Irma, as a stay at home mom, naturally started thinking about the possibility of opening a restaurant of their own. Referrals from customers grew so much that they decided to open their first location on December 12, 2007 at 830 Broadway in Bayonne, NJ 07002 and called it “El Aguila Dorada” a.k.a. The Golden Eagle. The location began as a restaurant and grocery store seating about 55 people. In 2014, El Aguila Dorada began to serve margaritas, sangria, and pina coladas so the grocery part of the store was removed and a little bar was constructed to add 10 more seats. Their success has led them to realize they must expand to service more customers because demand has exceeded their capacity so after successfully being open for 10 years, Israel and Irma decided to build their second location. 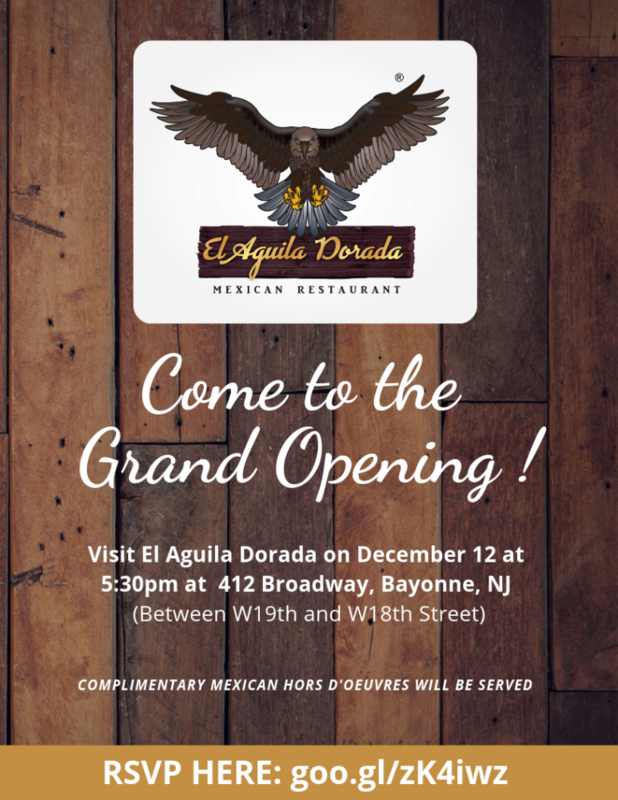 “El Aguila Dorada” now on 412 Broadway, Bayonne, NJ with a brand new concept, going from a mom and pop shop to a modern rustic Mexican Restaurant. This new facility is about 5,000 square feet, with 120 seats for dining and another 60 seats at the bar making it the biggest and best Mexican Restaurant in all of Bayonne. Supported by: the United States Small Business Administration, Small Business Development Center at NJCU, and New Jersey City University.